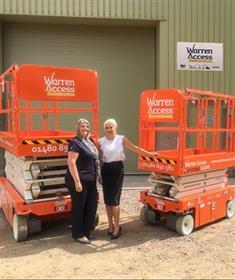 Following its recent investment in new premises, Warren Access continues to grow, with the addition of seven Snorkel electric scissor lifts to its fleet. Warren Access has recently taken delivery of an S3226E, an S4726E, three S3219E and two S4732E electric slab scissor lifts, which have been immediately deployed in the rental fleet. Celebrating 25 years in business this year, Warren Access was founded by Derek and Graeme Warren, who opened their first branch in Newcastle in 1993. The business expanded with a second branch on the outskirts of Huntingdon, Cambridgeshire in 2012, and today is directed by Graeme Warren, managing director, Michelle Warren, director, and Nikki Hill, operations manager. Warren Access recently moved into larger premises in central Huntingdon, Cambridgeshire, providing more space to accommodate its increasing fleet of truck- and van-mounted lifts, as well as a significant range of self-propelled access platforms. In addition to access platform rentals, Warren Access has become a leading provider of IPAF and Pasma training, with both branches listed as official training centres which are regularly fully booked. The company is also a member of the Access Alliance, enabling it to provide nationwide coverage. Graeme Warren says the company had Snorkel electric scissors in its fleet since 2006. "As we were looking to expand our current electric scissor lift fleet, the Snorkel range stood out to us. They are manufactured here in the UK; in fact, less than 20 miles (32 km) from our Newcastle depot, and have a lot of features built in which deliver real benefits to us as the rental company, and also to the operator. Snorkel UK has delivered a great service and we look forward to building the relationship further with Linda and the team."